← CAN YOU LAUGH AT THESE JOKES? 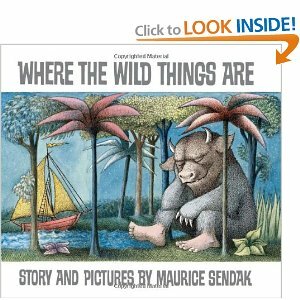 A child of Grimm’s Fairy Tales, Maurice Sendak understood that little kids loved to walk on the wild side in the safety of their parent’s arms. The right doses of scary stuff strengthens kids to face the world. Hovering parents and the Just-Keep-Kids-Happy gurus miss an opportunity to help kids face reality and build emotional strength. The main trick is to make the scary stuff just a bit above the child’s comfort level and then to use those times as teachable moments. Tip one: Honor the need of the young and not so young to test facing fears AND at the same start teaching what is real and what is not. Tip two: The smallest among us don’t have the judgement to know what is real and what is not. Any parent whose kid has tried flying off the top of the stairs thinking he is Superman knows what I mean. What to do? Start young to teach coping with reality by using the following praises even with toddlers. Children will still believe in magic, won’t fully get it for a while, but the foundation for thinking more critically has been laid. Anxiety disorders are high on the list of mental health problems and are apparently part of an inborn temperament trait–shy versus bold. So if you have a scared kid, probably somewhere in the family are other scared and nervous ones. I plan to write more about Taming Anxiety, but for now, you might find this ebook of mine useful – the message and exercises are universal, but applied to Taming Test Anxiety. 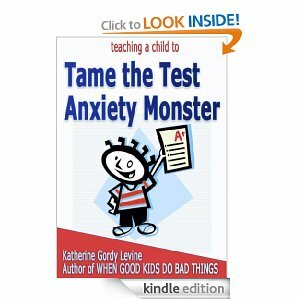 An ebook about test anxiety, but with exercises to help all who struggle with anxiety. For anxious parents, Parents Are People Too provides an Emotional Fitness Training Program that strengthens your ability to manage all sad, mad, and bad feelings. Remember, you don’t need a Kindle to read Amazon’s ebooks. You can download them to your computer using these apps. Practice kindness, share what you find useful, help me grow my blog and sell my books. If you buy any of my books, reviews help me reach more people. Kindness always circles back to bless you. This entry was posted in Parenting Issues and tagged Challenged Children, children and anxiety, Emotional fitness, Emotional Health, help for parents, Katherine Gordy Levine, Parenting advice, Parents Are People Too, postaday, Taming Fears. Bookmark the permalink.